(Bloomberg) -- Roberto Lavagna, who oversaw the rebuilding of Argentina’s economy after the 2001 default, is emerging as a compromise candidate in what looks to be one of the most divisive presidential elections in the nation’s history. The former economy minister would offer voters a middle path between current, right-wing President Mauricio Macri, on whose watch the country has fallen into two recessions, and former leader Cristina Fernandez de Kirchner, whose populist policies many blame for Argentina’s current economic woes. Lavagna says he wouldn’t run in a crowded primary race, but would be a candidate in a general vote. Still, the 77-year-old is no shoo-in for the October vote. First, he must convince the fragmented opposition to ditch Fernandez and other rivals to support his candidacy -- no easy task given the loyalty many feel to Fernandez and his own outsider status. Then he must convince voters that he can create jobs and boost salaries, without fueling inflation and collapsing the peso. Lavagna failed in a previous bid for the presidency in 2007 and backed a losing candidate in the 2015 race. As such, his track record against Fernandez isn’t encouraging. Many in the Peronist party, a populist political movement founded by former President Juan Domingo Peron, feel Fernandez’s tax and spending policies fit better with their agendas than Lavagna’s policies. "He needs the explicit support and political commitment of key Peronist wings," said Juan Cruz Diaz, director of political consulting firm Cefeidas Group in Buenos Aires. "It’s going to be very difficult or impossible for his campaign to prosper without that support. And if Kirchner is a candidate, it’ll be very difficult to get it." Candidates have until June 22 to officially announce their candidacy, ahead of elections to be held Oct. 27. A runoff is triggered if the front-runner receives less than 45 percent of the vote or less than 40 percent with a 10 percentage point difference to the second place finisher. The economist would win 58 percent of the vote in a runoff against Macri, according to a poll by consulting firm Synopsis cited in a March 29 Goldman Sachs report. Lavagna was economy minister from April 2002 to 2005, overseeing annual growth of more than 8 percent after his first year in office as global commodity prices soared and exports to China boomed. He restructured Argentina’s defaulted debt with foreign investors, getting most to accept 25 cents on the dollar. The remaining holdouts didn’t reach an accord until 2016. Lavagna also raised export tariffs to bring in more revenue, a policy that Macri tried to unwind before the currency crisis. Lavagna would renegotiate Argentina’s $56 billion credit line with the International Monetary Fund but would honor the deal, he said at an event Tuesday. While he will respect the fiscal targets set in the IMF deal, the solution to Argentina is not austerity, he said. "The fiscal balance objective is important," he told reporters. "But the solution is not spending cuts. The solution would be measures in the style of 2002." Lavagna, who met with IMF officials ahead of the organization’s third review of its financing program with Argentina, had previously railed against austerity and said he wants to focus on pro-growth measures. The candidate has yet to publicize any policy or opinion on other key issues, such as abortion, the Venezuela crisis, corruption or crime, according to a spokesman. For now, he is most known to younger Argentines for wearing socks with sandals, a fashion faux pas that triggered a social media storm in January about his age. With the Argentine peso under a close look by investors following a 50 percent drop last year and double-digit losses this year, Lavagna said Tuesday that he would not bring back currency controls but pointed to a previous policy that placed limits on short-term portfolio inflows. 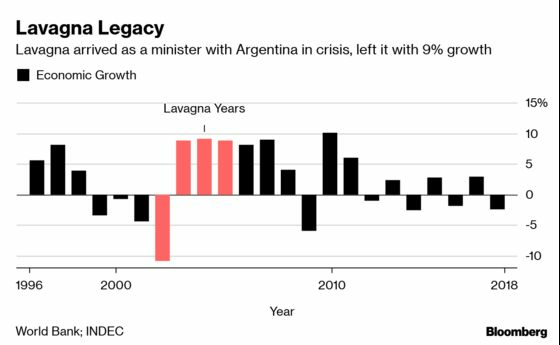 "Lavagna understands the need of having balanced accounts, but he doesn’t seem willing to do it via spending cuts," said Alejo Costa, chief strategist at investing firm BTG Pactual in Argentina.